Illinois Gov. J.B. Pritzker recently signed into law an increase to the state’s minimum wage. But restaurant servers, bartenders and other workers who depend on tips, say it’s not a full victory. Ramika Aton, who lives in Chicago, worked in the restaurant industry for many years. She said she put up with a lot while working in a burger restaurant. She recalls having to wear a tight, pink shirt with “1-800-call-juicy” written across the front, which elicited reaction from some customers. She said she would sometimes confront those customers, but she knows not all restaurant workers do for fear of losing out on the tips that can make up the bulk of their pay. Ramika Aton worked in the restaurant industry for many years. She says many servers experience harassment while on the job and never speak up for fears of losing the tip that makes the bulk of their wage. Aton says she wants Illinois to eliminate the tip credit. Aton and many others who work in the state’s bars and restaurants want to end the dependence on tips. “This is the only job where we are putting the bill on the public — where we're forcing the public to pay something that the employer is supposed to be paying,” Aton said. 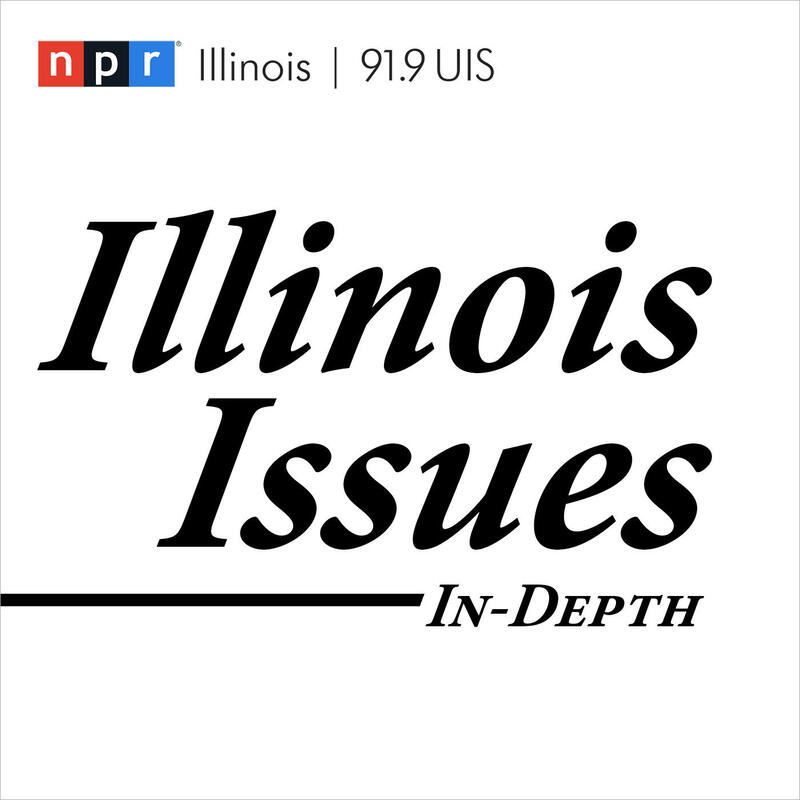 Illinois employers can pay tipped workers $4.95 an hour, and have tips make up the difference to reach the minimum wage. That system is called the tip credit. On slow days, when tips are not enough, employers are expected to put in the rest. Nationally, the base wage is lower, at $2.13 an hour, which has remained the same since 1991. Under Pritzker’s minimum wage law, that base wage for tipped workers would rise to $9 an hour over the next six years, while workers in other industries will reach $15 an hour. But some say that any tip system still puts workers in a vulnerable position — open to harassment and wage theft — and should be axed altogether. in states that require employers to pay the full minimum wage, workers have lower rates of poverty, and they’re able to better provide for their families. Those who took part in the Illinois minimum wage increase negotiations said keeping the tip credit was part of a compromise to get the Illinois Restaurant Association on board with an increase. The association, which represents restaurants from across the state, was previously opposed to increasing the minimum wage. Restaurant association representatives declined multiple requests for an interview but said the tip credit offers “flexibility” and serves as an “incentive” for good customer service. State Rep. Will Guzzardi, a Chicago Democrat, told tipped workers in February he understood why they might feel left out of the plan. “We know that our fight is not done,” he said during a news conference, right after he and several other lawmakers had joined Pritzker in signing the minimum wage proposal. 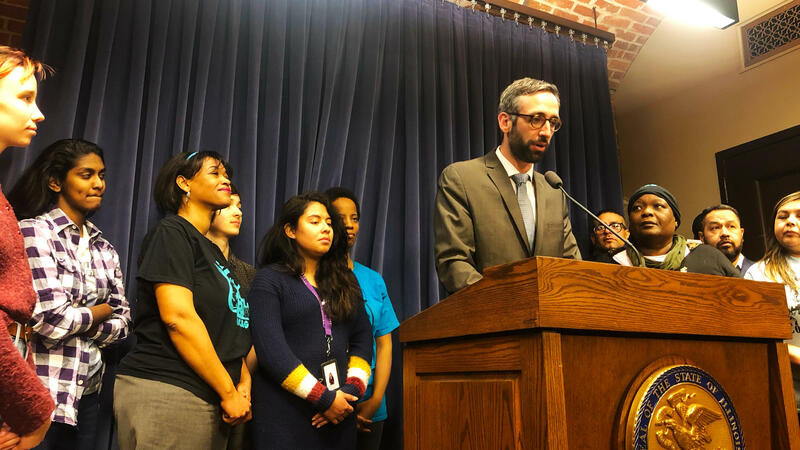 State Rep.Will Guzzardi, a Democrat from Chicago, in a press conference with tipped workers on Feb. 19, 2019. Guzzardi says he understands why tipped workers feel left out of the minimum wage increase and promised to help change what he calls "an unfair system". “I share your belief that that system is unjust, it’s unfair to workers, and you have my solemn commitment to stand with you in working on addressing the injustice of that system in the years going forward,” he said. While some business owners are pushing against the change, fearing a hit to their bottom line, others are taking a different approach. Mark Forinash, owner of Café Moxo and Café Moxo Too in Springfield, has been paying his employees at least $15 an hour for several years now. Tips are always separate. “We didn't want our employees to have to totally depend on tips. The tips are, what we consider going with your service above and beyond,” he said. Forinash said he built the wages into his business model, so he planned and made adjustments to afford it. Other employers in the industry, he said, would not have that option if the system changes, which is why he said he wouldn’t support eliminating the tip credit. Those who oppose eliminating the tip credit point to the state of Maine, where the tip credit had to be reinstated after removing it because servers in restaurants complained customers were no longer paying tips. So, there were no cash bonuses. Seven other states — California, Oregon, Washington, Nevada, Minnesota, Montana and Alaska — have already eliminated a tip credit system. "The seven states have higher restaurant sales per capita, higher job growth in the restaurant industry, higher rates of tipping and one half the rate of sexual harassment,” said Saru Jayaraman, co-founder and president of the Restaurant Opportunities Centers United (ROC United) and director of the Food Labor Research Center at University of California, Berkeley. ROC United did a study of sexual harassment complaints filed with the Equal Employment Opportunity Commission, which found that while accommodation and food industry workers make up 7 percent of the workforce, they account for 14 percent of sexual harassment complaints. Jayaraman said getting a higher base pay means workers won’t feel pressured with the loss of wages. “That means they can reject the harassment from some customers,” she said. Congress is also considering raising the minimum wage to $15 an hour. Phasing out the tip credit is also included in the proposal. 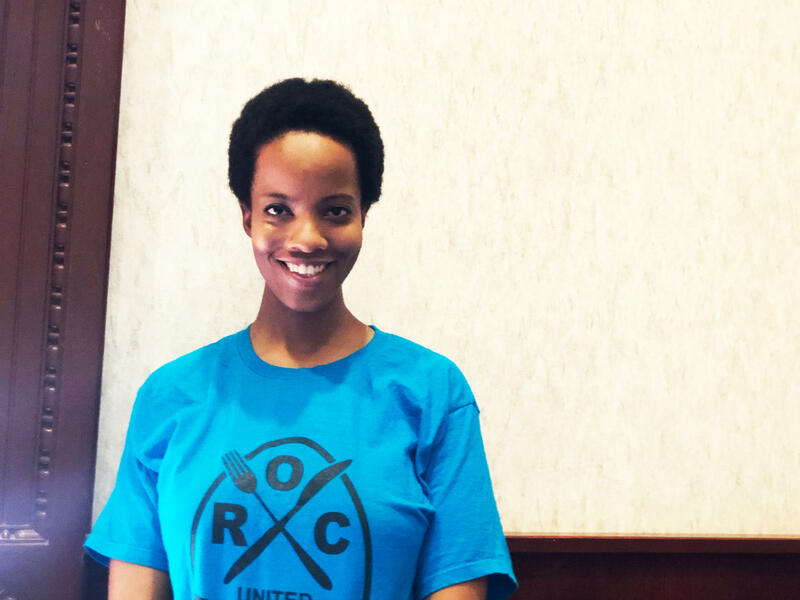 Ramika Aton, who worked at a burger restaurant, has left the restaurant industry and is now advocating for the “One Fair Wage” movement alongside ROC United Chicago. She says she’s optimistic — especially after Pritzker signed the minimum wage increase into law and many others supported the plan. Illinois became the first state in the Midwest Tuesday to increase the minimum wage to $15 an hour. Democratic Gov. J.B. Pritzker signed the measure at the Governor’s Mansion in Springfield.